In 1933, as George Gibbs released his grand development plan for Kings Canyon and as the Forest Service began the road into Kings Canyon, another event occurred with profound consequences for the future park. Newly elected President Franklin Roosevelt appointed as Secretary of the Interior a Chicago lawyer named Harold Ickes. In Ickes, Roosevelt had one of the most strong-willed, heartily disliked, and powerfully effective appointees in Interior history. The secretary took particular interest in the National Park Service, actively promoting, some say interfering in, decisions on the creation, funding, and management of parks. Among his accomplishments during his dozen years at the helm were absorption of national battlefield sites from the Department of War and of national monuments from the Department of Agriculture. In 1934, Ickes came close to adding the entire Forest Service to Interior even as the secretary of Agriculture campaigned to take over the National Park Service. These political maneuvers created a healthy distrust and dislike of Ickes by many both in and out of government, but particularly within the Forest Service and the forestry and ranching communities. Ickes also incurred the wrath of corporations for his anti-trust stance, all segregationist groups for his incipient pro-civil rights actions, and many politicians for his acerbic perhaps even brutal verbal and written assaults. He was dictatorial, suspicious, petty, and vindictive to employees and absolutely merciless with enemies. Forest Service Regional Forester S.B. Show later described Ickes as "overambitious, ignorant, egocentric, ruthless, unethical and highly effective." The last adjective conveys part of the positive side of Harold Ickes. He was highly principled and even righteous, and he was as tenacious a fighter as Washington has ever seen. If nothing else could unify the development claimants, this bill and the presence of Harold Ickes in the conflict did. A storm of protest from power, reclamation, tourism, grazing, and timber interests drowned Johnson's bill in committee. Thereupon, with the immediate threat of park status averted, the various claimants retired to continue maneuvering for control of the watershed, its lands and water. Los Angeles, its power needs temporarily satisfied by the huge, new Boulder Dam (later renamed Hoover Dam) on the Colorado River, dropped out, but the battle between irrigation and tourism factions continued unabated. The second thing that became clear was the confusion among park opponents as they bickered over different proposals for the watershed's future. Some wanted extensive reclamation, some wanted roads and tourism, some even wanted a wilderness preserve; all wanted it under Forest Service control. The one other view all locals shared, whether for or against a park, was a deep antagonism toward and fear of Los Angeles. Neither San Francisco nor Los Angeles had shown any compunction in recent history about stripping a watershed of its water and power resources regardless of the consequences for those who might depend for their very economic existence on those resources. Los Angeles had destroyed the Owens Valley, bled water from the Colorado River, and convinced the state of California to implement a vast plan aimed at shifting water southward from Sacramento Valley rivers toward the huge city. What chance did the Fresno Irrigation District have in blocking this imperialistic juggernaut? Here was the opening and the opportunity park backers had needed. Ickes, Kittredge, and Sierra Club members like William Colby conceived a plan to improve the Park Service's reputation and garner some critical support for a Kings Canyon park by dividing their enemies and playing on this fear of Los Angeles. The campaign began in earnest during the early months of 1938. Both Ickes and Kittredge commenced a series of radio addresses and speaking engagements aimed at newspaper publishers, outdoor recreation groups, influential women's and businessmen's groups, state and local legislators, and nearly anyone else who would listen. Most talks were in San Francisco or Los Angeles, although both men appeared in Fresno and other San Joaquin Valley towns during the next two years. Superintendent White also stumped about the state promoting the idea that Sequoia National Park was everyone's park and that they should support it and the Park Service. The real job of diplomacy, however, fell to Assistant Regional Director B.F. Manbey. Through the spring and summer of 1938, Manbey met dozens of times with civic officials, sportsmen's groups, publishers, businessmen's clubs, farmers, irrigation associations, and even timber and grazing interests to sell both Kings Canyon National Park and the Park Service. His seventeen reports back to Frank Kittredge in fact went to Harold Ickes, from whom Manbey took direct orders. Those reports show a vigorous, tiring schedule, a veritable whirlwind of speeches and panel discussions, and as near a piece of diplomatic negotiation as the Valley had ever seen. Manbey's orders from Ickes were strict and, given the source, surprising. He was not to challenge, insult, or in any way conflict with the Forest Service. Rather he was to strive for an image of calm, concerned reasonableness, exactly the opposite of how the Forest Service had portrayed the Park Service. Manbey told farmers and irrigation proponents that the Park Service understood and sympathized with their needs. Certainly the very fate of the nation depended on assuring the success of agriculture particularly in a breadbasket such as the San Joaquin Valley. He reassured the locals that Harold Ickes would see that their water needs were not ignored or usurped. And he was in a position to make good on that promise, for in addition to the National Park Service, Secretary Ickes had control of the U.S. Bureau of Reclamation. Slowly but surely through this media and personal campaign a compromise developed between Ickes and local civic officials, businessmen, and ultimately most farmer and irrigation groups. That compromise became the basis for the final successful push for park status, for the organization and operation of the future park, and for a series of promises the Park Service made which came back to haunt it later. Three conditions were to be met by the Department of Interior. First, immediate water and power needs were to be met with construction of a large facility at Pine Flat. The Bureau of Reclamation under Harold Ickes was to undertake construction with the brunt of the cost being borne by the federal government and the bulk of the benefit going to local water users. In addition, reclamation projects on the North Fork of the Kings River, well outside any proposed park, were to be sanctioned by Interior. 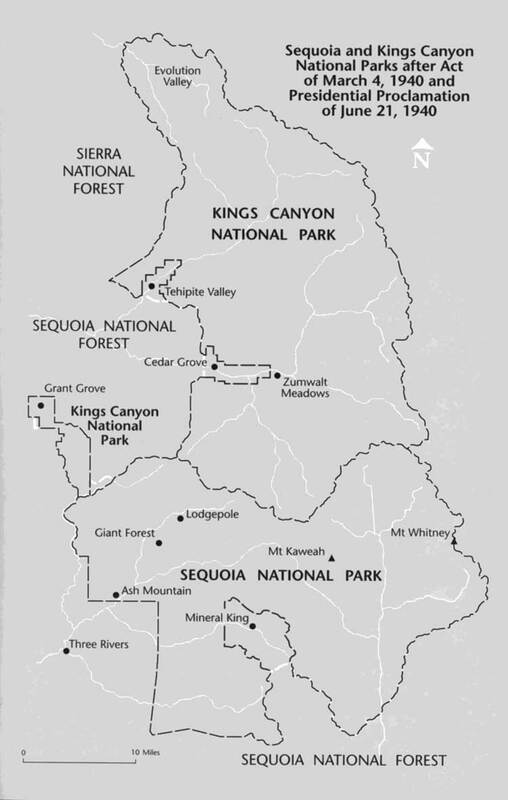 Second, Tehipite Valley and Kings Canyon were to be excluded from the park proposal. Both sites had been the core of the 1902 Geological Survey Report, the 1920 Los Angeles proposal, and the Randell Report. Although local farmers saw no immediate need for construction of dams at these sites, they were loath to give them up for park inclusion. One thing still clear after all the negotiations was that once in the park, these canyons would be forever lost to reclamation. Hence, both had to be withheld until future demand determined their importance. Exclusion of these magnificent canyons, the very heart of the proposed park, was a bitter pill for the Park Service to swallow, but one absolutely necessary to placate local water users. A curious rift had also developed in the preservationist camp. Several organizations, notably the National Parks Association and The Wilderness Society, opposed the Gearhart bill on the grounds that a park without the two canyons was unworthy. They insisted on holding out for a proposal that would include the canyons and perhaps some additional territory along the road from Grant Park to Cedar Grove. The Sierra Club and the Emergency Conservation Committee supported the bill, taking the pragmatic approach that a park without the canyons was better than no park at all. Besides, the threat to the canyons was not imminent and they might be added later. The outcome of the park bill and this latest and most organized Kings Canyon campaign was by no means clear when an unexpected and startling event occurred to demoralize and destroy organized park opposition. A busy Congress, preoccupied with continuing economic recovery and ominous events overseas, looked to local representatives for guidance on domestic issues such as the John Muir-Kings Canyon National Park bill. The two local congressmen were Bud Gearhart, author of the bill, and Alfred Elliot of Visalia. Elliott was deeply and emotionally opposed to it. He was also well known and respected, and his frequent antagonistic pronouncements about the bill, the National Park Service, and Secretary Ickes had an effect. Despite the compromise, the combination of Elliott's opposition and that of the state legislature still made passage difficult. Then, on March 4, 1939, an elderly Sierra Club member and park supporter, Mrs. Gertrude Achilles of Morgan Hill, California, wrote both congressmen urging passage of the park bill. In addition, she wrote a check to Gearhart for $100 and instructed him to apply it to the cause. However, she inadvertently enclosed the check to Gearhart in the envelope to Elliott. Upon receiving his letter and the check to Gearhart, Elliott envisioned a bribery scandal and saw a way to defeat the pesky conservation bill. He notified the FBI, made a copy of the check, typed a new letter and envelope, and had an ally mail the check to Gearhart from San Jose, near Morgan Hill. Gearhart received the check, but returned it to the woman, thanked her for her endorsement, and suggested she send the money to the Sierra Club. The trap had not worked, yet Elliott plunged ahead anyway showing the photostat of the check to prominent men in the San Joaquin Valley and to several other congressmen. Gearhart first learned of the plot when he received an anonymous phone call from a man who had been at one of the meetings where Elliott showed the check and implied corruption on the part of his Fresno colleague. in his tipoff, the speaker concluded, "He is out to frame you, Buddy, and I would not be a party to it. I had to tell you. Be on your guard." Over the next few days three congressmen approached Gearhart with the same news. Gearhart, a former district attorney, then set about collecting the evidence to protect himself and show Elliott's misconduct. He had an affidavit prepared from Mrs. Achilles, and reassembled the pertinent steps in the plot with evidence of motive and actions taken. During April 1939, Elliott compounded the problem by again suggesting to San Joaquin Valley men that Gearhart only wanted the park created because he would personally profit from it. The two men proceeded on a collision course. I have searched the precedents of this body, searched them down through the last 150 years of the history of this body, and I fail to find one case referred to in those proceedings that even approaches that which I have been compelled to lay before you. I ask no action. There was a time when I thought of expulsion. There was a time when I thought of disciplinary action. But all that is past now. The record is made. I am content. Thus ended a sixty-year conservation struggle, one nearly unrivaled for rancorous debate, emotional character assassination, and political wheeling and dealing. 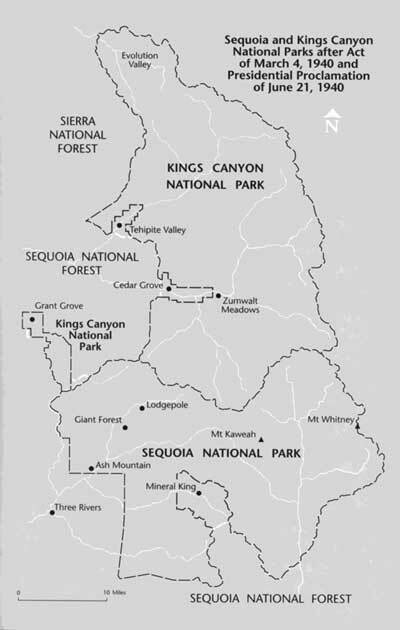 Three factors were important in the creation of Kings Canyon National Park over the objections of numerous and vociferous groups. First, the opposition's inability to unite allowed park proponents to divide and conquer them. Second, this same disunity prevented development of other forms of land and resource use which would have doomed the prospects of a park in the region. Finally, an amazing and egregious political blunder eliminated the last stumbling block by infuriating both Congress and the public to righteous and convenient indignation.